GoGreen Campaign Ride 04 Jul 10 "Fuel Hike ?? 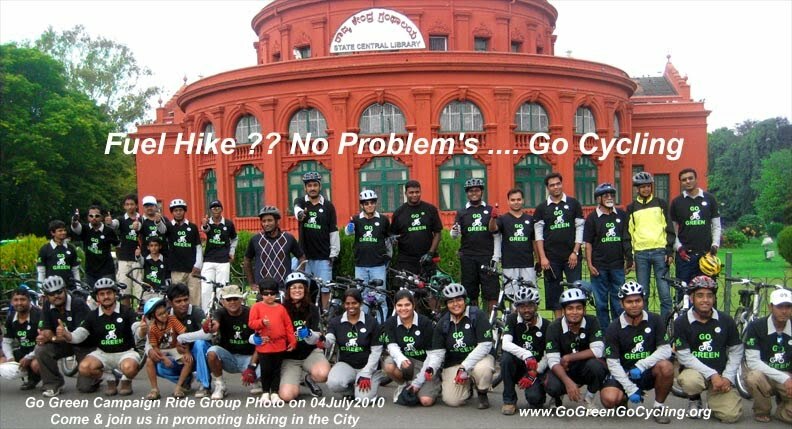 No problem, Lets Go Cycling" - GGI-Group size: 4000+ Professionals, Increasing on day to day basis, Come & join us 2 serve Mother Nature. GoGreen Campaign Ride 04 Jul 10 "Fuel Hike ?? No problem, Lets Go Cycling"
Chidu's Son Vaibhav who is 6+ cycled along with the team for almost 30km's.. We all hope people watching him would definitely get inspired ..
SAMYA a local Kannada news channel covered our Campaign Ride and was relaying every 1 hr starting from 1:00pm. A big round of Applause to all the Green Initiators.... Our message of Going Green is strongly being conveyed. All in all, it was a huge turn out and would thank all GGI's who took out their Sunday morning's family time and made this event successful. Would appreciate each ones efforts in making the city more Greener..
Cubbon Park – MG Road – Brigade Road – Jhonson Market – Bannerghatta Road – Mico rear gate – Dairy Circle – Bannerghatta Road – BTM Flyover – JP Nagar. Go Green Group Snaps during the Campaign Ride..
Their was not a single indication of exhaust on his face.. As his T-Shirt says Rock Out !!.. He was definitely rocking the whole GGI-Group around him. hope to have more and more families coming out on our campaign rides..
TV covered our GoGreen Campaign Ride.